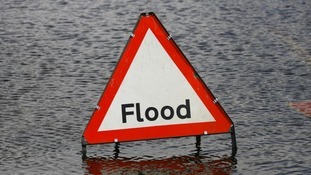 Flash flooding hit parts of Northampton during the Bank Holiday weekend. There is growing anger in Northampton as victims of the Bank Holiday flash floods say more could've been done to stop it happening. 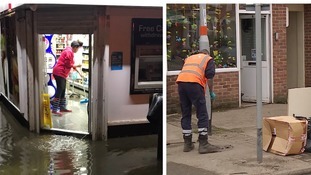 More than 100 homes and businesses were flooded at the weekend as heavy rain lashed parts of the region. The county council says it's doing its best to support residents but some have accused the council of failing to keep the drains clear. More than 70 homes and businesses have been destroyed after the town was badly hit by heavy rain overnight. Emergency services are door-knocking 30 homes at Hemsby in Norfolk and offering residents temporary refuge until the high tide subsides. Great Yarmouth Council says it is an advisory evacuation to a rest centre which has been opened at Hemsby Village Hall. It comes are more empty properties on the clifftop at Hemsby were claimed by stormy seas. "This is a purely precautionary measure, taken in light of the risk posed through further loss of cliff material to the privately-owned clifftop vehicular access road to The Marrams. "Officials will continue to monitor the road and incoming tide throughout the evening. Tonight’s high tide is expected to be higher than yesterday’s, due to the weather conditions. "The public are reminded to stay away from the area to the east of The Marrams road, The Marrams road itself and the beach directly below the cliffs, as these areas remain dangerous. Stormy weather at the weekend has caused further erosion of the cliffs at Hemsby in Norfolk which could threaten clifftop homes. Flood alerts have been issued for parts of Essex, Norfolk and Cambridgeshire as stormy weather hits the coast. The Met Office has issued a yellow weather warning for strong winds and heavy rain in the Anglia region on Monday.